Bespaar $25.00 door nu voor die optie te kiezen. Prestashop Etsy Marketplace Integration module is the easiest way to connect your Prestashop store to the popular Etsy Marketplace. You can manage your Esty product listings and orders from your PrestaShop store itself. Etsy Prestashop Integration module is a perfect solution for the Prestashop store owners who also want to sell on the Etsy marketplace in parallel to their own store. While selling your products on two different platforms, you need not manage your PrestaShop store and Esty shop separately. With the help of the Prestashop Etsy Integration addon, you can now manage it from your Prestashop panel itself. The Prestashop Etsy Integration extension allows you to sync the product listings with your Etsy with great ease. The automated approach of Prestashop Etsy Integration plugin saves your time and effort to manage the Etsy listing separately. Admin can install the Prestashop Etsy Integration module on their shop like any other Prestashop module. The Prestashop Etsy API integration module can be enabled/disabled anytime as per their wish. The seller can list their Prestashop store's products on the Etsy Marketplace along with their details and quantity in bulk with the help of Etsy Prestashop API integrator. Admin can map theirPrestashop Store's categories with Etsy Marketplace Categories. The Prestashop Etsy connector offers many-to-one category mapping option. Admin can manage orders received from the Etsy marketplace from the admin panel of Prestashop Etsy synchronization module itself. Prestashop Etsy integration addon allows the admin to add Shipping templates for their Etsy Marketplace profile. The shipping templates can be edited or deleted as per the requirement from the back-end of the Prestashop Etsy integrator. Prestashop Etsy API integration addon even allows the admin to add different shipping options for different destination countries. The admin can map your Prestashop store's order statuses with Etsy Marketplace order statuses by executing cron inEtsy Prestashop Integrator. You can mark an order status from your shop to be used as delivered/shipped status on Etsy Marketplace. 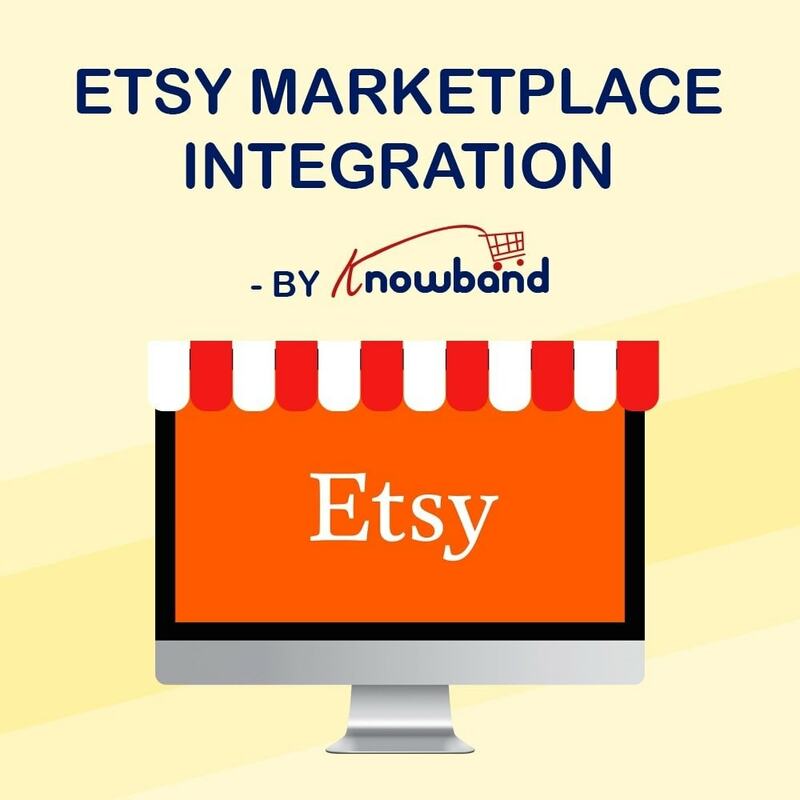 The change in the order status can be reflected in the marketplace with the help of the Etsy Prestashop connector. You can map Prestashop attributes to the corresponding Marketplace attribute to get the attributes values during products listing on Marketplace. The profile-based listing makes attribute mapping effortless for the Prestashop Etsy integrator. You can specify if a product listed on Etsy Marketplace from your shop is customizable or not. You can create different profiles for product listing on Etsy Marketplace. You can Edit or Delete a profile anytime. Or you can just enable or disable a profile instead of deleting it. You can see a list of all the products selected for listing or already listed on Etsy Marketplace with their status and values. Etsy Prestashop integrator allows the admin to track the errors and bugs with ease. Separate menu tab for Prestashop Etsy Integration module is added at back office after module installation. The separate menu tab consists of Sub-Menu tabs to manage Prestashop Etsy Integration module. Separate tab to manage the module settings and configuration. Admin can update Etsy API details to be used by the module to Sync the store with Etsy. There is no need to setup the connection every time until/unless admin disconnects it or it gets expired. The Prestashop Etsy integrator offers uninterrupted connection. Admin has the option to set the minimum threshold quantity for the Etsy store products so that as soon as the product quantity reaches to the threshold value the inventory status for these products will show the status as Critical. Admin gets an option to create profiles for product listing on Etsy Marketplace. Profile Management tab of Etsy Prestashop Integration module allows the store admin to map the Prestashop store categories and attributes with the Etsy marketplace categories and attributes. Admin can easily map entire Prestashop store category with the Etsy category. The products of the mapped category are listed and the admin can upload the products in bulk with the cron option offered by Prestashop Etsy integrator. The Prestashop Etsy connector offers easy profile management. The admin can also choose to just enable/disable a profile rather than deleting it. Admin can exclude the products from the profile created in Etsy Prestashop connector., The excluded products will not be listed on the Etsy marketplace. Admin can add as many Shipping templates in the back-end of the Prestashop Etsy integrator. Admin can edit or delete a shipping template anytime. These shipping templates are used by the Prestashop admin to show shipping options on his/her products on Etsy. These templates can be synced with the marketplace by executing cron inEtsy Prestashop integrator. Prestashop Etsy synchronization plugin even offers an option for the admin to add Shipping Upgrades to the Shipping Templates. Admin can sync the existing Shipping Templates from the Etsy store by running the cron in the back-end of the Etsy Prestashop synchronization module. Admin can map the Prestashop store's order statuses with Etsy order statuses. Admin can see the list of orders received through Prestashop Etsy integration plugin. Admin can see the order details of his/her products listed on Etsy Marketplace in the back-end of the Etsy Prestashop integration extension. Admin can change the order status of the orders received from Etsy. Admin can mark an order status from his shop to be used to indicate as delivered/shipped status on Etsy Marketplace. The order status can be synced back to the marketplace with the help of cron jobs offered by Prestashop Etsy integration module. Admin can see a list of all the products listed already on Etsy. The cron jobs offered by PrestashopEtsy integration plugin even allows the admin to sync the product status. Admin can see a list of all the products that are in process for listing on Etsy. Admin can renew if updated product details and re-list are deleted after listing on Etsy at a button click from the back-end of the Etsy Prestashop Integration extension. Admin can see the product details in the same list of products. Admin can always sync the changes made in any listing through Synchronization settings. Prestashop Etsy integrator offers bulk action to Sync Product Listing, Variation Listing, Product Image, Product Quantity. Admin can generate the sales report for the Etsy shop sale. The Etsy Prestashopintegrator offers complete sales and revenue report to the store admin. Admin can generate the Product Sales reports for the individual products as well with the help of Prestashop Etsy integrator. Audit log helps the admin to check the status of all the tasks performed by using the Etsy Prestashop API Integration module. Shipping upgrade: This feature offered by Prestashop Etsy Integration addon allows the admin to add shipping upgrades in the previously defined shipping methods. The admin can add multiple cost structure as per the requirement from the back-end of the Etsy Prestashop integration extension. Option to add Custom pricing: Etsy Prestashop Integration addon allows the admin to list the same products at a different price at the marketplace. With the custom pricing feature offered by Prestashop, Etsy Integrator allows the e-sellers to increase/decrease the cost of the products listed at etsy.com by a fixed amount or percentage value. After fixing the custom price, the admin can sync the changes with the marketplace by executing cron in the back-end Prestashop Etsy API integrator. Add threshold limit for the stock: The admin can fix threshold limit for the marketplace inventory with the help of Etsy Prestashop API integrator. In case, the stock goes below the specified limit, the admin will receive an alert for the same. With the help of this feature offered by Prestashop Etsy integrator, admin prevents the products from going out-of-stock. The real-time synchronization of Etsy Prestashop integrator enables the admin to manage everything from a single interface. Sales Report: The Prestashop Etsy connector provides the complete sales report for your Etsy shop. The admin views the overall sales and revenue from the back-end of the Etsy Prestashop connector. The Prestashop Etsy synchronization extension provides the sales report of the individual products as well. Exclude product: The admin even gets an option to exclude individual products from a particular profile with the help of Prestashop Etsy Synchronization addon. Shop Section: To make online shopping easier for the Etsy customers, the store admin can even create shop sections at the marketplace. This implies that the admin can create various sections/categories in their Etsy shop and map the relevant products in the respective section. Enable/Disable the listing of a particular product: The Prestashop Etsy integration module even allows the admin to enable/disable the listing of the product at a button click. Auto product renewal: In addition to this, the admin can even enable or disable product renewal option. If auto-renewal is enabled, then, the products will be automatically renewed at the marketplace. Relist/Delete: The products that are expired from the marketplace can be relisted at a button click. If required, they can even remove/delete the products from the listing. Product Update at a Button Click: The product details such as images, product descriptions, other related details at a button click. There is no need to execute the crons individually. The store admin is required to execute a single cron job and all the related details of the products are synced with the marketplace. Integrate your Prestashop store with the popular eBay marketplace and extend your reach in no time. You will be able to showcase your Products on an already well-established eCommerce site. Customers can browse the products on Etsy from any Prestashop store who has this module. You will expand your Store's reach to a wide range of audience. You will get more customers for your products as compared to your own website. Etsy already has an established base of customers, that all can be yours. Customers can view all the mapped products and their details on Etsy. Customers can see the mapped shipping options available with your products. Customers can buy directly from Etsy and you can manage the orders from your Prestashop store itself. You can even integrate your Prestashop store on other popular marketplaces with our addons. You can even create your own marketplace like Etsy and eBay with our Prestashop Marketplace addon. Our team of skilled and experienced developers has been working on Prestashop for more than 8 years. Velocity has been developing plugins under the brand name of Knowband for over 3 years and has more than 50 Plugins for Prestashop. Mobile responsive One Page Checkout with Facebook/Google+, MailChimp and Ship2Pay feature. It can be used with any theme & any payment method. Compatibility with 30+ Payment & Shipping Methods.This One Page Checkout Module is GDPR compliant. The PrestaShop Marketplace plugin converts a simple PrestaShop store into a feature-rich Multi seller Marketplace with GDPR compliance in just few clicks. Prestashop Abandoned cart(Email Follow up) addon helps Prestashop owners to track the abandoned carts on the store and send automatic/manual email reminders(with or without a discount coupon) and a link for direct checkout from the email.